Andrea, a friend and coworker has a pear tree in her yard. This week we were blessed with with the best of this year’s bountiful crop. What better way to celebrate the harvest than with a delicious vodka drink featuring the freshly squeezed juice of the pears. We found a great drink on the website for the Cirque de Masse, which are great creative holidays held in the Loire Valley, France. I didn’t know where it was either, so here’s a Google Map link. The drink was designed by their resident mixologist Wayne. Everyone at Madtini Labs salutes Wayne with this refreshing summer drink. Cheers! Remove leaves from a sprig of rosemary and place in a cocktail shaker with lime juice. Muddle the rosemary and lime for around 30 seconds or so. Add ice, vodka and pear juice. Shake the ingredients vigorously and then strain into a chilled cocktail glass. 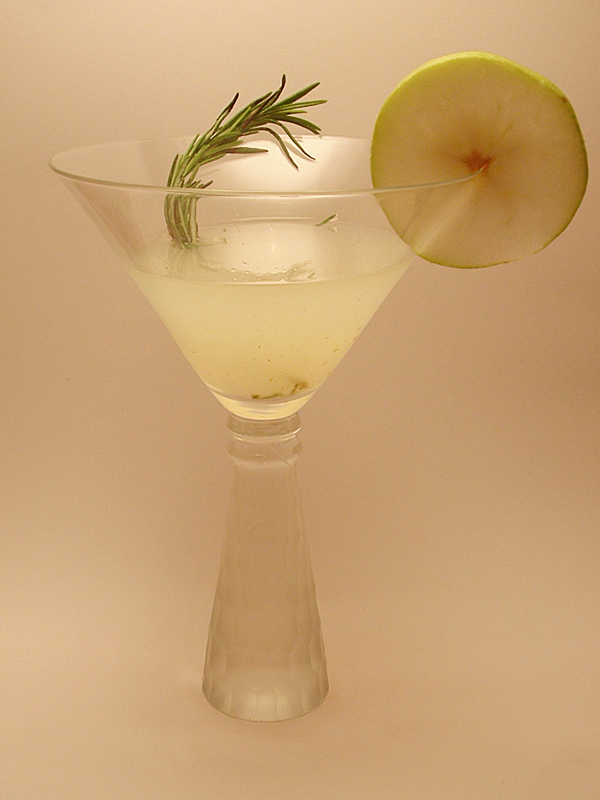 Garnish with a spring of rosemary and a slice of pear.